In an effort to highlight places of interest in countries across the world, their varied culture, economy and history. Know all about Morocco. Weather and climate: Morocco’s climate is very diverse, varying with the season and region. In general the country has a tropical climate, with temperatures reaching as high as 35°C and as low as 5°C in the Sahara. The coast has a warm, Mediterranean climate tempered on the eastern coast by southwest trade winds whilst inland areas have a hotter, drier, continental climate. Rain falls from November to March in coastal areas, and the country is mostly dry with high temperatures in summer and a cooler climate in the mountains. The best time to visit is during the shoulder seasons of April to May, and September to November. Secular celebrations: Moroccans celebrate a number of national holidays such National Day (3 March, in celebration of King Hassan II’s accession to the throne in 1961), Independence Day (18 November), Green March Day (6 November).Among the most popular festivals are the National Folklore Festival, held in Marrakech each June, a Festival of Roses, held in El Kelaa des M’Gouna each May and a Date Festival held in Erfoud each October. Food: Fusion isn’t a new trend in Morocco, where the cuisine is a blend of Mediterranean, Arabic, Jewish, Persian, West African and Berber influences. Meals range from the diffa, an elaborate multi-course feast featuring couscous and grilled meats, to quick brochettes (kebab) from a roadside stall. Tagines, the fragrant stews of meat, vegetables or fish, named after the distinctive conical earthenware vessel they’re cooked in are the Moroccans main staple. Flavours revolve around a subtle array of spices, and traditionally every spice shop would have its own secret ras el hanout spice blend recipe. Scrumptious local specialities such as almonds, olives and a rainbow array of spices can be found in souks across the country. Some of the specialities are Harira (a spicy tomato-and-lentil-based soup), Pastilla, Couscous and Mechoui. Mint tea (aka “Berber whiskey”, a strong green “gunpowder tea mixed with fresh mint and heavily laced with sugar) and Coffee (French press, espresso or Turkish style) are regional drinks. VISA: A tourist visa is issued for a period of up to 90 days. Documents required are passport (valid for at least six months from the desired date of entry into Morocco), three visa forms (photocopy allowed, The first form should be completed in original), three passport-size colour photographs (3 cm x 4 cm with white background. Applicant wearing a tie, if male). A covering letter (if self-employed then the letter should be on the letterhead of the company), authority letter from the applicant authorizing the agent to submit and collect the passport on his behalf and confirmed onward/ return air tickets, Confirm Hotel Vouchers, Original Personal bank statements (for last six months updated with bank seal and sign on each and every page) and Overseas Travel Insurance. Meknes: Located in the north of Morocco, and is a 9th-century medina and also one of the country’s previous capitals. 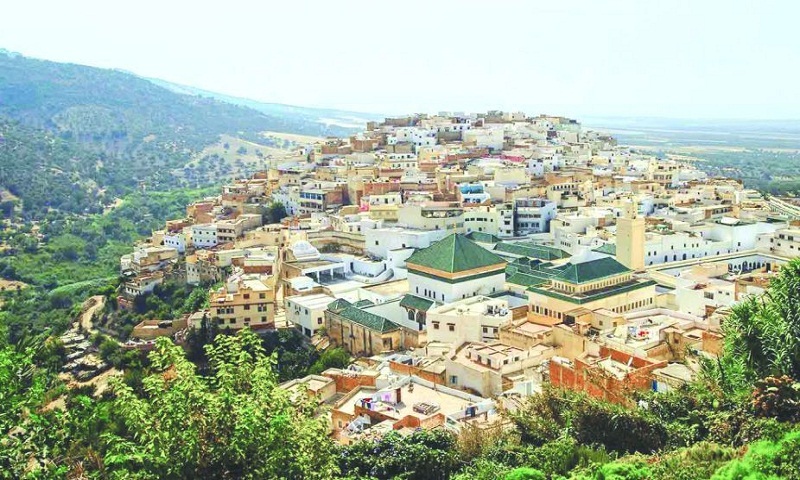 Meknes is one of the four Imperial cities of Morocco and its name and fame are closely linked to that of Sultan Moulay Ismail. Explore the major historical sites like Mausoleum of Moulay Ismail, Bab Mansour, Dar Jamai Museum, etc. to learn about Morocco’s culture. Marrakesh Medina: Located north of the foothills of the Atlas Mountains, Marrakech is a bustling city with a largemedina, and one of the popular Morocco tourist attractions. From the central square of Djemma El-Fna to the El Badi Palace, and the bustling souks or bazaars, there’s a lot to do and see here! Chefchaouen: In the beautiful Rif Mountains, Chefchaouen is a gorgeous labyrinth of blue-on- blue buildings that has an incredibly photogenic glow. It's simply about wandering the Medina alleys and lapping up all that colourful architecture. It is a popular shopping destination offering many native handicrafts that are not available elsewhere in Morocco. Volubilis: Morocco’s number one Roman ruin is a feast for history-lovers with a clutch of remarkable mosaics still interred where they were unearthed. This site is also full of tumbled columns and temple remnants, standing as reminders that even the greatest empires eventually crumble. The hilltop location allows the ruins to lord over the surrounding countryside, adding to the romantic ambiance of lost glory. Other popular attractions are Oudaias Kasbah (prettiest corner of Rabat), Fes el Bali, Tangier (the most European of all Morocco’s cities), Ait Ben Haddou (fairytale place, definitely must visit), Dades Valley, Essaouira, Erg Chebbi (Morocco’s eastern Sahara region) and Hassan II Mosque (Casablanca’s landmark building).